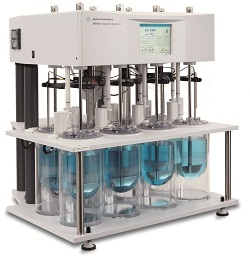 AGILENT’s new 709-DS dissolution apparatus, used to test the release profile of pharmaceutical dosage forms, features a bath-free design to provide the operator with an unobstructed view of the dissolution vessel. The instrument also increases laboratory efficiency, says Agilent, through rapid media heating and elimination of water bath cleaning. “The 709-DS offers peace of mind for researchers in quality assurance and quality control,” said Allan Little, Agilent’s director of marketing, dissolution testing. Based on the same platform as the 708-DS, the 709-DS is equipped with AutoTemp in-vessel temperature sensing as standard. This measures and records the temperature in each vessel, individually, before during and after the dissolution run.